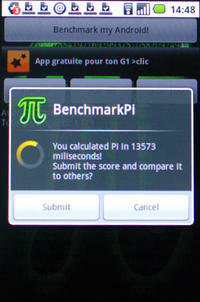 Benchmark your Android device by calculating the Pi and compete your time with others! Try to be the first in the Top10 list! BenchmarkPi Version 1.01! Added: Top 50 and Top 100 list, averate time and total participants. Name: Daniel B. Aus H.
Very usefull tool to check the CPU speed of different Android Devices, different ROMs on the same device or even if your Android device is overloaded. BenchmarkPi -The Android Benchmark Tool! BenchmarkPi application is going to have a MAJOR update, please be patient for a while! For more information about what BenchmarkPi is, please visit the How it Works page. Copyright © 2009 Ventrix - Konstantinos Polychronis. Design by Andreas Viklund.